In this new video, Heath Smythe, Delight Training Specialist at Infusionsoft, shares with us how Infusionsoft utilizes Memberium and Learndash to train their employees and customers. You’ll get the inside scoop on how Infusionsoft decided to start using Memberium and an exclusive inside look at how the sites are built. Plus, find out what Heath learned throughout the process of building both sites at Infusionsoft and discover how the same lessons learned can be applied to any new membership site or online course. To top this off, Justin Ferriman, the Co-Founder of LearnDash, joins us to share a few important trends that are currently reshaping the e-learning industry. If there’s one person who has their finger on the pulse of what’s happening with E-Learning and WordPress, it’s Justin. To find out exactly what these trends are and get an inside look at Infusionsoft’s new Memberium sites, check out the full video! Ready to get started with Memberium after watching this video? Micah: Hey everybody, it’s Micah with Memberium and today we have a really really special treat. I don’t know if you can tell but I’m extremely excited. We have Justin Ferriman from LearnDash and we also have Heath Smythe from Infusionsoft. So today what we’re gonna do is we we’re donna hear some of the latest and greatest from Justin, you know, from LearnDash and for those of you who are not familiar with LearnDash, it is the tool, basically, that we’ve used as a company and advocated to all of our clients for the past couple of years and Infusionsoft is also using now Memberium and LearnDash together. So, it’s a, you know, we’ll talk more about it obviously. There’s also a webinar we did with LearnDash before with lot more information. We’ll put the link to that under this video, but as you’re watching this, you know, I hope what you’re getting from it is a mix of the really strong academic side which Justin brings, which LearnDash brings, and the really strong marketing side which, you know, Memberium and Infusionsoft put together. So, Infusionsoft is obviously a really heavy marketing automatization software. And LearnDash, what I like about it, and for those of you who don’t know, I’m not well-educated, you know, I didn’t go to college or anything, and I really like that Justin brings that into the picture that’s highly academic, you know, really high quality learning management system. We love LearnDash and other learning management systems but there’s a reason why we really stick with LearnDash and recommend it because the other ones, they’re okay but they just do not go into the depth. And some of the new stuff Justin has to share with you about what’s coming out in LearnDash, to me is some of the most exciting stuff to hit to the membership space since LearnDash itself, since the course progression stuff, this new level that he’s gonna talk about is super super exciting. So, let’s go through and just kinda introduce. So, Justin, welcome to the call, why don’t you tell them just real brief, maybe 60 seconds about yourself a little bit so they get to know you and then we’ll introduce Heath an go on from there. Justin: Yea, sure, well thank you for such a warm reception. Justin, my name is Justin Ferriman am the founder, the co-founder of LearnDash. My background is in E-learning and learning management system, prior LearnDash was studying these up for four to five hundred companies. And through that experience with my wife co-founded LearnDash and brought that knowledge I had from those consulting engagements and put it into this product and I think you alluded to, we’ll get to, and Heath overview. There’s a lot of cool things that we’re putting into this software that are taken directly from the latest trends in the E-learning space and, you know, it can be used in academia but it can also be used from the marketing stand point. That’s what makes it so exciting. Again, happy to be here and looking forward to the conversation. Micah: We’re just really grateful that you’re on the call cause Justin is the real deal. Like he said, doing this at a really high level and then moving that into a software product that is very widely used, you know super stable, like said, we use it ourselves and plan to use it for the foreseeable future. But next is Heath from Infusionsoft and Heath has become a really good friend of mine just from working with him on a couple of their membership sites. And what I like about Heath and what I mentioned to Justin is, Heath also has kind of a background in adult education, you know, helping people be able to consume the content they need to and basically get to learning from and that’s what Heath is really in charge of at Infusionsoft and it’s been heading up using both Memberium and LearnDash to create an experience for, and I believe Heath that’s, you know, partners and customers that you’re using this for, right? Heath: That is correct, absolutely. I’ve been at Infusionsoft now for about two and a half years. I started off as a coach here at Infusionsoft where I was helping our new customers get set up in the software and I first started at 60 days so that’s where I really uncovered a true passion for helping our customers be successful and in the learning space so I kinda took on a new initiative from the coaching role and helping our employees internally set up a progression path, a system that they could use to grow in their role, learn the software, learn more about their role and just become better employees all around. So, that was a great initiative that I took on for quite a while and I eventually migrated into taking a lot of those learnings that we did and setting up an awesome membership site using Memberium and LearnDash, taking those learnings and translating that into building a system for our customers. And that’s really what I’ve been focusing on heavily fro the past 4-5 months now, is building an amazing platform for our customers to get the how to product training during the kickstart. So, super excited to be here today and show you guys what we’ve been doing. I think there’s a lot of good stuff that I’m excited to share that a lot other people can take some good nuggets from as well. Micah: Yea, and I appreciate your time as well and Infusionsoft’s, you know, support and using our product. So, where I wanna start maybe is just kinda to pre-frame a little bit of what Heath’s doing that, to me, is really interesting. And, you know, Justin, Heath, you guys can jump in at any time, we’ll keep this pretty loose, but what I find interesting about it is the training, for example, for the customers, it goes hand in hand with the kickstart that the customer is receiving from the coach, meaning they’re gonna have some coaching calls and that’s, you know, related to the content that they’re receiving on the membership site. It’s also interesting to me because I have a software company that, you know, what just, sorry, what Heath has been kinda looking at and some of his goals putting aside together, and Heath you can talk more about this, but being able to track and try to correlate the customers success with the training that they’re taking and then obviously kinda iterate the training to improve customer success but it’s a, you know, it’s not a situation where they’re selling the content, at least not yet. They’re using it as a value add and then onboarding tool basically to improve the overall experience. So, maybe Heath you can give us a high level of some of your goals and we’ll jump more into the tactics of how you’re accomplishing them but if you just wanna share some of the goals and some of your thinking around it real quick, that’d be great. Heath: Yea, I mean, like, our primary goal with this platform is really to provide our customers with a really easy to follow structured system to retain relevant how to product training during the kickstart. I mean, we’ve got customers that come in that are varying levels of skill. Some are beginners, some have little to no experience in the world of sales, sales and marketing automation, some are intermediate, some are advanced. So, what’s amazing about this site and using Memberium and LearnDash is we can really position the most relevant content in front of the customer when they log into their site using Memberium and LearnDash. So, our goal has been to “hey, let’s figure out what our beginner persona really is as a customer, what does the intermediate persona look like and the advanced and then what problems do they have that they’re often trying to solve during the kickstart”. So we can then position the appropriate content in front of them in the first 30 to 60 days. What this does is it helps chunk down the amount of content that they’re being asked to consume in the first 30 to 60 days and making sure that it’s the most relevant as well. So that’s really been my goal and what we’re tracking right now is usage. We wanna make sure that customers are getting in and logging in, consuming the content, they’re seeing value at least in some way, shape or form. So the feedback we’ve gotten up to this point is they love the system, they love the website and the ease of use. The constructive feedback, obviously, that we’re getting which is expected is just the quality of the content. So, we just gotta go in, make some adjustments and, you know, kinda fine tune some things but for the most part we’re really excited about the path we’re on and, you know, accomplishing some of the goals that we’ve been trying to accomplish as a company now for five years, so, all good things. Micah: Nice, and yea, that’s actually good to hear that there’s not accessibility issues, you know what I mean, or like needs or experience issues, that’s a good place to be because you can re-film. And, if you mind sharing a little bit, so, that’s the context of customers, what are the other contexts you’re using the membership site for, like partners or employees and maybe some of the goals or learnings from that? Heath: Yea, great question. So what we’re also using a very similar site, just a different domain for our internal progression path, as I mentioned earlier, where our employees can log in and kinda get their own tailored progression system. So that they’re consuming content that’s relevant to them and their roles. Some are overlapping but some are specific to their role. So, for instance, the two primary paths that we’ve worked on internally are for our coaches. So we’ve leveraged the Memberium features and functionality to say “hey, if you’re a coach, when you log in we not only want you to see those overlapping courses but we also want you to see these courses that are really relevant to you and your role as well” because we feel like there’s some importance behind that. And then as a support rep, same goes for them. They don’t see all the coach specific courses, they’re only seeing the courses that are specific to them and their role. So that way it’s a very tailored experience for you the employee, you’re being, you’re maximizing every minute you have without being feeling overwhelmed with all this different content, all these different tabs, you can keep the site very structured to the employee. So, we plan to branch out and continue to make different paths for different employees down the road, but coaches and support reps are the two primary positions that we focus on up to this point. Micah: No, that’s great. Lately, I’ve been talking a lot in different environments about the need for internal training and that was part of what also spurred this webinar between Justin and I as we talked about some of the trends, you know, in membership site and E-learning and one of them was, yea, you know, more internal training sites, more employees getting trained and the efficiency of that is huge. I mean, especially a company at your guys’ size. Now, what was pretty interesting to me too about, when we first started working on some of this was, there was some additional complexity that most of our customers don’t deal with. Meaning, they, most of our customers, they create a site, you know, they create some course to put them into it and they wanna sell those courses and that’s mostly it. But what was kinda fun about working with you Heath, was not only were you transitioning from another system and so there was kind of some, some stuff to migrate over and some situations to handle as far as, you know, for example, employees who had been there for a while who are already at the expert level, you know, they had conversations around do they have to, you know, are we gonna force them to take this before that kinda thing or how do we let them bypass it, you know some of those. And then I also thought it was interesting, the accountability, you know, aspect that you brought into it of, you know, not only are we trying to deliver content but we actually told them they’re accountable to consuming it, and, you know, how do we keep them from cheating, how do we keep them from saying they watched it but not really watching at the time, like having another window open and some of those things. So, it was a couple extra layers, which was kinda fun. So, before we again go into too many details there, what I wanted to do is I wanted to come back to Justin for a minute. And, you know, Justin, like said, I’ve known him for quite a while, have a tone of respect for him, especially because that academic background as well as having a killer software product, but I really like too, that he, whenever I talk to him, you know, he’s very aware of what’s going on in the WordPress world, in the E-learning world and what not. And so, Justin, I know you’ve got a couple things to share with us, would now be a good time to jump into that? Justin: Yea, absolutely. So, yea, Micah, as you’re talking about, you know, the trends and the E-learning space, this is something that I really get excited about because, you know, as I keep my finger on the pulse of this industry, we try to incorporate what is, you know, what the trends are and what is working into LearnDash the best way that we can so people that are using it for internal training like at Infusionsoft, like you guys are doing Heath, or for people that are selling courses as you alluded too, Micah with Memberium and LearnDash, they can leverage these two for their business goals. So, when I think about in a year term what the trends are in E-learning there’s two that stick out to me so this picture here, I’m sure you’ve been familiar with this, and you think E-learning, you’re sitting at your laptop or your computer, you’re going through a course, be it an onboarding course or a company or maybe you purchased a course, and you’re just taking the content. And this is still very much part of E-learning and it’s not gonna go anywhere anytime soon. But, that brings me to the first major trend and that is mobile learning. Now this is important. In the E-learning industry there’s many different fassetts. And every year, year over year, we’re seeing growth in the E-learning industry. This past year, mobile learning was the growth driver in the entire industry. So, meaning, if mobile learning was not part of E-learning, so we didn’t have it, the industry actually would’ve lost some of that total market value but because mobile learning exists and, you know, the technology around mobile learning is getting better, it’s driving the growth of the industry. So, this is telling us that mobile learning is now becoming more and more important to people. And it’s not really that hard to imagine. I mean, think about the times you’re maybe at the airport and your flight is delayed. You know, people take out their phone start going, looking at e-mails, watching videos, that’s a perfect time to reach these people for taking a course. If they have nothing better to do they might as well take a few lessons in a course that they’ve purchased or if they have to take compliance training, what have you.. So, this is a huge, huge trend in the E-learning space. So like I said, it’s on-the-fly learning, you can do it from anywhere and this is also true with tablets. A lot of times people will be sitting at home watching TV with a tablet in their hand kinda rifling through whatever it is they wanna look at. It’s easy to go through a course. So, designing a course with mobile in mind is gonna mean you’re gonna reach a lot more people. So, this also brings up a concept called Micro-content and this is another trend that’s kinda related to that mobile learning trend. Micro-content for, you know, not getting too complex with it, is just content that can be consumed easily. Alright, so you have maybe videos in courses, and we’ve all seen courses with videos, and, but those course videos sometimes can be very long. What we-re seeing with Micro-content is that the optimal videos range, time is gonna be 5-8 minutes no more than 8 minutes, 8 minutes is a long one. So, you know, somebody, if they’re on their phone, waiting for that plane to let them board then they can go through a five minute video and mark that lesson complete and move on. So, these concise videos, Micro-content is also, applies to text, you know, just text that is really shot and succinct to the point as well as info graphics. If you can take a concept and display it in an info graphic that somebody can consume easily and quickly then they’re gonna do, they’re probably gonna go through your course a lot quicker and they’re gonna retain that content. Especially if it’s centered around a single objective. Which is again, a really important part of Micro-content. A lot of times in traditional E-learning that we see today will be many different objectives in a course. With Micro-content you narrow that down. Because people with mobile devices, they don’t have time to sit there for an hour to go through your course. They have bits of time to go through your course at different parts of the day. And so, that also means taking a long course and breaking it up into multiple courses. A lot of times you’ll see one course with a tone of lessons and a tone of sub lessons under that, that’s great and that works, like I said, there’s a reason people do that because that’s what you were used to doing and that’s what company has been doing for a long time but now with the mobile industry and the mobile trend on the rise, breaking that up into multiple courses is going to increase the completion rates. Because people get discouraged. They go into a course, if you have 20 lessons and you spend 20 minutes and you get through two lessons, okay, you know, you kinda lose momentum. With mobile learning it’s all about momentum. How can you carry that person to the next lesson. People love marking things complete, they love finishing and seeing how far they’ve gotten in a course. If you’ve got multiple courses then they can say okay I got course part one done, course part two done etc. and a whole curriculum. So that’s the one, the first major trend that we are seeing in E-learning now and it’s actually started a couple years ago but it’s really gaining momentum. The second trend is a little bit more abstract. It’s freedom. Okay, and this is what I kinda determined in looking at how people are going through these online courses. By freedom, I mean freedom of choice, freedom of taking control over your learning, choosing your learning path. So, I’m gonna give an example, think about in the US anyway that we have high school before going to university. In high school, the curriculum is very linear. Everybody has to take the same thing, everybody, you know, has to take the same thing around the same time, have to go, you know, from 9th to 12th grade depending on the state you’re in I guess. And, it’s very structured. There’s a little room to choose some extra stuff that may be of interest but you know, there’s these standards that and so everybody has to take that exact same training. Now think about what happens when you go to university. When you’re in the university all of a sudden there isn’t that structured path, you know you get to choose from all kinds of different disciplines. And even when you choose your discipline yea sure, there’s gonna be some required courses you’ll have to go through, that’s to be expected, but you also get to choose within that curriculum the courses that you wanna take. So, you know, a lot of times universities, they have 100 level classes, 200, 300, and so even in the 100 level classes you maybe have to take one and then you get to choose a handful of others. Then you get to the 200 but only after you’ve completed those 100 and you get to do the same thing and the same thing at the 300 level courses. So the reason that is effective is that it gives people a freedom of choice, they can really take control of their learning. So, we’re taking that same concept of freedom of choice, taking control over the learning path and putting it into our software. So now, when you create a course, and this is just a screenshot from LearnDash, you can enable prerequisites, I think we’re all familiar with the prerequisite and what that entails but you can also set it to be, you know, user has to take any of these courses, maybe they have to take all of these courses. And this is a really cool part where you see it says enable course points, you can assign points for a course so when it’s completed the learner gets those points, okay great. Now you can also, and right below the course points, course points access. This means that’s how many points you have to have to take this course. This allows you to set up a curriculum, like I just explained, university curriculum. But it doesn’t have to be for formal education, I mean you can do this if you have a coaching program, platform or a marketing course you can do the same thing and give your learners a degree of freedom on how they go about their learning path. And, so, this is what we’re bringing into LearnDash now because we see this as a huge trend and this, the freedom of choice and the curriculum paths coupled with the mobile learning, this is what ultimately is gonna drive conversions, and then the E-learning space and then online courses we talk about conversions as completions. Because if a user completes a course, if you’re selling a course this means you now have somebody you can upsell or cross market to with other courses or other offerings that you have. You know, for internal training it means that people are learning the processes, now they may be ready for more advanced courses or suggestions or coaching calls. So, completion rates are kind of the gold standard when it comes to online courses. To increase those completion rates, you need to have a mobile designed course and I don’t just mean like mobile, like you can do the course on mobile applications, phone or tablet but I also mean designing the content so it can be consumed on mobile. And that just means plain to that micro-content approach. And then also, I’d given the user the freedom, you know, nobody wants to just be told they have to take, you know, one, two, three, four, five, six and then get to the next course and do the same thing. Open it up a little bit, let people own their learning cause when they own it they’re ultimately gonna learn more and that’s really the goal of the whole thing. Micah: I don’t know if you’re getting excited about this Heath, cause I’m sure you can se some news cases for yourself but when Justin first told me about this I was so excited. And, I’d been even talking yesterday with a friend of mine from the UK and I was talking about you know, profiling your users, and then, let’s say you get three different profiles and then you can have three different paths for them but those paths always, at least in the past, used to still be in linear. You now have three different linear paths but they’re still linear, you know. And this is so exciting to me because, you know, for everyone watching most of you are using Infusionsoft so you kind of understand, you know, what it takes to learn Infusionsoft and that’s really what Heath is teaching is you know, hey employees you need to learn it, partners you need to learn it, customers you need to learn it. But as Justin was saying, this kind of makes that a lot more free and I think a lot more engaging for them and they’re gonna be like ” well, I only wanna learn about these parts” and even if they do try to jump ahead it’s like hey, you need to go get some points in the basic level so that you can understand this upper level but we’re not gonna force you, you know, to go in a certain order. And, so, you know, Justin, when you were first telling about this, I hadn’t, like I said, I never went to university or anything so I wasn’t aware of that structure as well, you know, somewhat aware, like when you brought it up I was just oh my gosh it’s like a light turned on because I’ve been, for so long, trying to figure out an efficient way to profile people and let them choose their own adventure, if you wanna put it that way. And it really wasn’t that efficient but with this type of system it just opens up a lot of doors so I’m super excited. Justin: Yea, Micah, we are too and I think a part of it is becoming a trend and we’re just at the beginning of this kind of freedom of choice in the online space, obviously we had it in traditional education institutions but, you know, the technology is there now and the expectation is there, so many people take online courses and so, it’s a, we’re excited to have this and we think it does open up some possibilities in the marketing stand point, for people selling courses and also in Heath’s examples that he’s gonna go through, from internal stand point I think there’s a lot of different adequate use cases especially with the different levels of users that he was discussing, the people that were new to marketing automation or people that were experienced etc. But, like I said, some of these things I know we had talked about Micah and Heath and I know that you, being the designer and developer that you are, for all this course and this E-learning program at Infusionsoft already incorporated so I’m excited to see some of those aspects that you’ve put into your courses that made them so successful. Those are some big time bullet points that Justin had just covered and we focus on very heavily in both platforms really, so I’m more than happy to show you guys what that looks like. So, you can see that the sites that you guys are looking at right here, this is our progression path site. So, this is again what our employees internally are using, when they log in they see a full menu of training courses over here, they can see personal development, they go a “My Achievement” section. So some of this stuff, what I wanna do is just show you real quickly, from a prerequisite perspective, Justin and LearnDash gave us the ability to really quickly and easily set up a system that says “hey you have to complete this course before you can take that course”. It’s really sequential, our progression path is. So, in the training, you can see here, we got a menu of all different types of training, since I’m logged in as an admin I can see them all. However if I was logged in as a support rep I would only see support level one, support level two and support level three. I wouldn’t see all these other menu items here. So, that’s again Memberium doing it’s job. Here is where the prerequisites come into play. So we have a very definitive course structure to this kind of stuff where our employees, we want them to take certain courses before they take other ones. So, for instance, the leadership model courses, we actually have a couple different leadership model courses. One is the intro course, one is the leadership model care course, so we want our employees to be taking the leadership model intro course before they take the care course. So that’s one of the perfect examples of using the prerequisite features that LearnDash provides you. It’s really just a click of the mouse, you can set that up. So, that’s something that we use in multiple areas throughout our progression path system but I just wanted to highlight and from a gamification perspective, we do that over here under my achievements, you can see that when you complete a course you actually earn a badge. So, we’ve got our own system set up internally to keep people excited and engaged in the content that we add so those are just a few things that I wanted to highlight. There’s a lot of different stuff that I can get into but I just wanted to show you guys real life examples of the prerequisites and the gamification piece. Justin: Yea, Heath, just a question. I know you’ve mentioned you’re using this for two different programs at Infusionsoft, which site is this that we’re looking at and what is the main purpose of this one? Heath: Great question. So, this site is the progression path site. So this is for internal use, this is our employees, not for customers. This is progressionpath.infusionsoft.com, it’s what our employees use to grow in their role. Justin: That’s great. Thank you. Micah: So, Heath, maybe you can mention a couple of differences or were there differences between, you know, doing this for employees versus content for partners versus content for clients. Like, what did you have to change, if anything, and how did that work? Heath: Yea, so, for employees, we really just, we have a definitive like path for them to go level 1, level 2, level 3. And we had to really decide okay what content is relevant for coaches, what content is relevant for support reps, and what content is relevant for both. And so we would set up permission tags that would give one access to the select content or the appropriate content I should say. Whereas, with SBSA, in other words, our customer facing training platform, this is, I just switched tabs, this is the other membership site that I’ve built here designed for our customer training. The biggest difference here is it’s really a one linear path, it’s not a multi-dimensional path. At least for now it’s not. Doesn’t matter who you are as a customer, as soon as you buy the software, you get access to this site. This site is designed to provide you with the appropriate how to training at each phase of the kickstart. So, again, it doesn’t matter who I am, as soon as I log in I hover my mouse over kickstart courses and we’ve got literally a path that we ask you to follow step 1, step 2, step 3, step 4. Each step is designed to get you prepared for your next call. So this is a much more linear path than our internal training platform is where is more multi-dimensional or dynamic I should say. If you’re a coach you log in and you see these courses, if you’re support rep you log in and see those courses. Here, very one dimensional but a lot of the same concepts are there as far as work flow goes and how we deliver the content. Micah: Got ya, as I understand it, making it all the same for everyone was very intentional, right? You wanted all your customers, at least for now, to have the same experience of it, cause I know back in the day when different success coaches were doing different things were, even before that, when they called them implementations instead of kickstarts, you know, people were just kinda doing their own thing. So, I know the goal of this was consistency so that was probably intentional, right? Heath: Yea, absolutely, it was really intentional. And we’re also in a learning phase right now so the next phase of this project is for us to say ” Okay we probably have different types of customers that come in and I alluded to this a little bit earlier in the conversation, but we probably got the beginning customer, the intermediate customer and the advanced customer. So, eventually we probably will make this site a little bit more dynamic than what it is right now, but before we do that we first wanna solve what we believe to be 60 to 70% of what our customers need as soon as they buy the software. Most customers need to know how to import their contacts. Most customers need to know the basics of a campaign builder, most customers need to know how to send a broadcast e-mail. Very simple things that at the end of a 30 to 60 day period if you don’t know how to that stuff the chances of you cancelling is probably gonna double. So we wanna make sure that we deliver the basics regardless of who you are, beginner, intermediate or advanced, and just provide you with a one linear system. Down the road we might get a little bit more fancy with it but yea, we want consistency. That’s the end game, is consistency. Micah: Yea, beautiful. Maybe what we can jump into for a sec, if I can touch back on micro-content, you know, the mobile content that Justin mentioned. I think I remember you saying, Heath, that one of the things, like one of the benefits of having a membership site this way was that the employees were not only watching it at work but they could watch it at home or on the weekends and things and on their mobile devices, right? Heath: Absolutely, so jumping back into our progression path here, so now I’m back into the employee training membership site here, that was a big use case for our employees. They said ” hey this is awesome but I don’t have time to take these courses when I’m at work because I’m working so I would love to have accessibility to this stuff when I’m at home or maybe I’m just travelling to mom and dad’s house two hours away on a weekend, hey I can hop into my progression path and knock out a couple courses. So, it’s been a very useful tool on having a mobile friendly site and huge for our employees. Again, going back to completion rates, they have the ability to log in and actually get some of these courses completed, it’s all mobile friendly. Micah: Yea, that’s beautiful. One other thing that’s kinda interesting about this site, so he’s using the buddy boss theme and what we did and what I admire about Justin is even though they’re a big company, not Justin, sorry, Heath in this case with this site, is they’re another big company and they have the resources and you know the reason to make this site very complicated as you can see with the customer, you know, facing site, kept it simple. And the reason I bring up the buddy boss theme is this theme normally would have a bunch of other functionality related to a community, you know. And so, what I found interesting was, you know we first looked it in and it was like oh there’s all these possibilities we can do this, we can do that, and people can private message each other they can be in groups and we kinda stripped it all out to focus on the training so there is less distraction. And then, you know, we kept a couple things, like the my achievements part is a cool part that was kept but getting rid of some of the stuff that could be a distraction from the training, especially for a company of your size, was cool. And I say that because a lot of our users they’ll be just getting started and instead of starting with like a phase one, like you said Heath, we made it this way and now we’re in the learning phase to see what to do next, a lot of people will try to jump ahead five phases. You know, they’ll see this and be like oh, you know, I need x number of courses and I need a giant community and all this tracking and gamification stuff but the reality is, you know, just kinda getting the content out there so people can get into it and you can see what they’re liking and not liking initerate. That’s a much wiser path to follow and so just you kinda taken that right away, I was honestly a little surprised by it cause I thought oh it’s a bigger company, they’re gonna over complicate it, it’s gonna be this long project but you turned it around actually pretty quick, relatively. Especially, and maybe you can share a little, you were using some different systems before and like the time to set up was much longer, right? And LearnDash really cut that down. Heath: Oh my Gosh, it was four times as long. In fact, there was a level, there was a few days when I, after I had been introduced to the WordPress Memberium LearnDash combo, where I was actually a little mad because I’d realized how much time I had spent in other membership platforms trying to build something that took, what takes five minutes in Memberium and LearnDash, would take several hours in this and some other systems. So, it has saved a tone of time as we continue to develop and grow it makes it a lot easier for us to pivot and make adjustments based on what we’re finding. So, that’s been huge and kinda alluding back to what Micah you were saying and, you know, starting simple. That’s the biggest piece of advice that I would give to anyone that is trying to build a membership site, a website or really anything. Back in my coaching days, I would always preach to my customers the main thing is to keep the main thing the main thing. And I try to follow that motto and eat my own dog food as I move forward a build projects myself. It’s easy to over complicate something. It’s easy to get oh we want this, we want that, we want all these bells and whistles because they look pretty and can probably do something cool. But first, we have to get true values set up. We gotta focus on the customer and their needs. Once we start solving for that stuff, we can then make calculated decisions and add additional features and functionality as we grow and as things make sense. So, to help solve a lot of problems and complications, try to keep things simple right out of the gate and focus on the version one. And that’s not to say version one has to be, you know, some makeshift dodgy system. Version one can still be pretty good. Like this is version one of our onboarding system for our customers. I’ve gotten feedback from my customers that say this is a pilot, this is a test, I thought this was the finished product. I just recently got that feedback a few days ago, this is how good it looks, it looks like a fully finished product but it’s still version one. So, you know, stay focused on what’s most important and what’s your primary goals are and then expand from there. Justin: Heath, thinking about this site right here, I know this is for a customer or new customers bringing through the different parts of Infusionsoft and clearly there is incentive for new customers to go though that because if they complete the course, then my guess is here, that they’re, chances are they’re gonna stick with the program and maybe not wonder off or get discouraged, so can you maybe elaborate on things that you did with this set up with LearnDash, Memberium and different themes and what not to help drive those completions? Heath: Yea, so I mean really it all comes back to the quality of the content at the end of the day and some of the automation e are doing between calls to drive people back to the site but giving, from a Memberium and LearnDash perspective, like giving people the ability to see what they’ve visually accomplished, you can see these green check boxes here, when you’re done with a course, psychology wise that’s a sense of accomplishment. Okay, great I finished that one now I only have two more to go before I’m on my next call. Awesome. Justin: That’s really cool, yea. Heath: Yea, absolutely, there’s all kinds of other stuff that we wanna do to drive usage as well but, you know, that can turn into another 45 minute conversation. Justin: So what’s really needed is like you have multiple pages, so if you go back to that main page that you were on right beforehand, you’ve kinda like, I really like this, what you did at the very top, right here this colored, the kickoff call, the coach call, one two, campaign launch.. So it’s almost like you, for each one of those you have these different action plans with different courses and lessons and videos and concepts for each one of those so I really like, I have to compliment you, this is really great that you are here, that you are here in a section that’s really good for somebody to see their visual progress and then to kinda see what they have coming up. They drill down into a course to see “okay I have couple more stuff to go and then I can move that”, you know, you are here up to the next section. Micah: And, if I can cut in for a second, just for anyone watching, to fill in a couple of the details of what’s happening here, it might be something we can do to go in the back and a little tho I don’t wanna get too technical but just to mention that you know, Heath didn’t do a lot of you know, programming or development on this. So he’s put in a few custom images like that image at the top, but the rest of the layout is basically LearnDash. These little blocks here with the green check mark, Dave and Andrew from our team at Memberium kinda helped add the check mark to them basically. But LearnDash has a course grid like that. And, I’ve built into it. And the pages that Heath was showing where there’s the check marks and he was saying they might come and only a few of them would be checked off, right now Heath is logged in as an admin so it shows them all checked off, but to a normal user they’d have like one green check mark and then four gray ones that they havent done yet so when he says that visually, you know, that’s one of the main things they’re doing, is allowing people to see where they are. You know, that really comes automatically from LearnDash, like things checking themselves off, progress bars, the basic layout of the lessons for example when he goes into a course. That’s all, you know, standard LearnDash stuff and so I just wanted to point out that this wasn’t like a giant design and programming job, there’s a couple modifications to make it a little special but it’s really a theme in LearnDash you know and a couple plugins and things put together. And then again, this is just for the people who aren’t familiar with some of the technical details, if you know Infusionsoft, it’s the tags in Infusionsoft that are being used to drive some of this. So you can have a tag grant access to one of these courses or to a whole bunch of courses and when they do complete a course you can apply a tag back in Infusion, so you also have the ability to, for example, if they start a course, send them a reminder in a few days that they didn’t finish it, from Infusion. So LearnDash will tell Infusion or via Memberium it will say “hey, you know, they started in on this course, start this timer that if within 7 days they haven’t finished it, send them a reminder, or maybe within two or three days”. But just to connect the dots for a few people who don’t know how all this works together, I just wanted to kinda point that out and then for a minute touch back into the micro-content. Justin, when you were talking about the mobile learning thing, I thought a lot more about that, you know since we had originally talked and even on this call a lot of it is coming back to me that there’s a lot of additional benefits to that so, you know, Heath, I know right now, your videos, it looks like these are actually shorter, I was gonna say I know you had some longer videos before as well, at least in the internal side, some longer videos and what I’ve really been noticing lately with shorter videos is, you know, all the additional benefits. Like, you guys have both mentioned, shorter video that someone can get through quicker is a quicker win, right? A little bit of better feeling getting through something and completing it versus dragging on forever. But also, for the content creator, for the person creating the videos, one of the big things I noticed since I switched to small videos is how much easier is to replace them or to edit them, you know. If I had before a 20 minute or 30 minute or hour video and some parts of it became outdated it was a lot messier to update that video. You know, to cut in a little piece in the middle of the video and not just messier because it was inconsistent with the rest of the video, but the time it takes to handle files of that size is also not a huge problem, you know, where technology is at today, file size ain’t too big of an issue but when you consider the mobile environment and people’s connection feeds and things like that, getting smaller videos to them is much more efficient. Meaning, If I look at a five minute video because I have five minutes I’m gonna use a lot less data than if I only have five minutes but I have to load and buffer an hour long video. Right, so if I pull up an hour long video to watch five minutes, I’m gonna use more data then if it was just a five minute video. And then I wont even know where I stopped in the video when I come back and you know, a lot of those problems but again, for the content creator, swapping out little chunks is so much easier basically than trying to edit a portion of a bigger video and re-render a whole giant video after you’ve edited a small portion, re-upload, swap out and all that garbage. So, I just wanted to kinda touch on that and then see, Justin if you had any, or Heath, either one of you guys have any thoughts on that? Justin: I just wanna say, I don’t really have much to add, I think people may be wondering okay where is this coming from and the one thing I always mention is think about when you go to Youtube, Youtube’s one of the most popular sites in the world, the second biggest search engine after Google, so a lot of times when people watch a video, cats or whatever they’re watching, after a little bit of time you start to get an itch, you start to go, you wanna go to another video. I mean, our attention spans are so short and I don’t mean that in a negative way, I mean there is a lot competing for our attention that the shorter you have those videos, you know they quickly win your attention. You get a quick win with a short video and you’re on the right path. If it’s too long, eh you know, you’re gonna lose some learning there. Heath: Yea, that’s really how we at Infusionsoft have been able to scale our content, our content creation work. There’s only so many of us in our software, the Infusionsoft software that is, is changing every day. And so, it is difficult for even a team of 3 or 4 to stay on top of those changes, always be making adjustments, if our content is an hour long. So now that we’ve kinda shifted gears and structured our content in such a way where it’s delivered in short little 3 to 5 minute chunks, makes it much easier for us to go back into the system at any point in time and just update one little sliver instead ot the entire hour course itself. Micah: Yea, absolutely. And another benefit that comes to mind is search ability. You know, if you had like an hour video you’d have to create a whole listing of chapters, an outline of what’s in it, right, for somebody to be able to find it versus these small chunks that are like ” Here’s how to upload a CSV file ” you know, that’s it basically. When someone searches that, they’re gonna find the video they want and I think, kinda like Justin said, Youtube is a good example and I’ve asked people this as well. You know, if you go to Youtube and you search for an answer to something and it pops up and there’s three videos and one of them is 3 minutes long and one of them is 20 minutes long and one of them is an hour long, you’re most likely gonna go to the 3 minute video, you know what I mean, you’ll hope your answer is contained in the shortest segment possible. So you don’t have to pan through a giant video to figure it out. But yea, like, search ability, being able to index like you’re saying, Heath, being able to swap them out because I’ve been in the exact same boat as you. Meaning I have a membership site that trains on Infusionsoft and yea, especially me being on the outside trying to train on your software and then it would change underneath me and then like crap I got 40 hours of content that’s now worthless basically, versus now, and I’m not, you know, pursuing the Infusionsoft training thing but basically kinda what the small content and what LearnDash and some of these things it’s like “oh no they changed one screen in the software, let’s go re-film this 3 or 7 minute video or whatever and then we’re done, not a big deal”. It’s just so much easier and one of my friends, Creig Jacobson who’s a really really strong marketer, I wanna say is a little over a year ago now, he was really pushing mobile first from a marketing perspective and kinda his position on it was you know, you need to make everything for a mobile world just assume it will be delivered mobile so if you have a headline that’s 20 words long, make it 7 words. And he did some exercises around that and the point he made that really stuck with me was improving the mobile experience, making things shorter and more concise. That’s not only good for mobile, it improves the desktop experience as well, so it’s, we talk a lot about mobile but just kinda keep it in mind like Justin said, desktop isn’t necessarily going away and the fact that this makes it better as well is just kinda win win win all around. You know, I love the trends that are happening right now, to me, I really love because, you call the second one, Justin, freedom which is a little abstract but I think the mobile side is freedom as well. You know people have freedom of location, time and as they start being able to choose their courses the overall learning experience is just, it’s actually getting pretty blissful. Honestly, compared to what it used to be, right. Like go to a video that’s hard to get to, the environment looks ugly, it takes forever to download all this kinda stuff and then you forget where you left off so this new stuff is a breath of fresh air. So I got a couple questions and I’ll kinda ask both of you guys this, if it’s okay, and we’ll go Heath then Justin, so, Heath now that you have built for example this site, customer site, and I know it’s not been out there too long, but if you had to start over, knowing what you know no or what you’ve learned in the past while, is there anything you would change and if so, what might it be or what might you do differently? Heath: If I had to start the project over, you know, I learned a lot from progression, from learning the internal employee training platform so I feel like the way we got off to a start with the actual customer training platform was really efficient. Honestly, not to toot my own horn in any way, shape or form, it’s just we grew a lot when building the internal training membership site for our employees. Going into that one, I think that’s the one were if I could go back I would have done my research a little bit more. Right out of the gate, before you build a membership site find out what’s best for you and what you’re trying to accomplish and really, you know, see what features and functionality are there, obviously we’ll get reviews, LearnDash and Memberium are amazing platforms that will obviously make your job a lot easier and there are other platforms out there that you know, might offer some other stuff but, you know, from a simplicity perspective, might not quite be where you want it so do your research, figure out what systems are best for you so you can make sure you’re spending your time building in something that you feel like you can scale. A least for a couple of years without having to, you know, then regret “oh we built this in the wrong system and now we gotta switch” so to speak. I think that was the biggest hiccup that we ran into, it’s just, we started out in the wrong system. Micah: Got ya, yea that’s some advice and Justin, kind of similar question to you, you’re in a different position but I know you’ve got you know, your software and you have your membership site for users of your software as well, if you could go back and change something either in the membership site or, you know, kinda your course of creating LearnDash, what might it be? Justin: I think, you know, there’s a lot of ways of looking at it, but I think what he said about knowing what the end is before you start a project. When we talk to people about LearnDash, we always check with them to see if our solutions would be right for them because sometimes it’s not, it might be overkill. 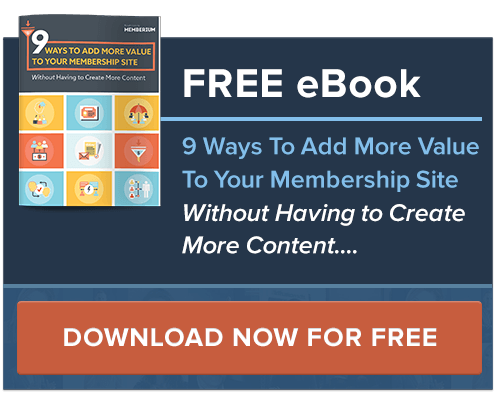 You know, when we talk about membership sites do you actually need a learning management instrument or do you just need a little bit of content production with some downloads you know. I think it’s the research upfront, compared that with those solutions and objectives, you’re gonna be in a much better position down the line for scaling that like Heath was saying. Knowing what it is you want to accomplish before you just jump in, you know, whatever software looks nice, cause there are a lot that look nice out there, I can certainly relate to that advice that he gave because when we started our software it was the same thing, you know like, start with certain systems and maybe we just did it because it was the first thing that we saw and we didn’t really know the company or the people behind it so much, maybe they went out of business or maybe they’re gone now. And we were stuck where we needed to make that transition when we could’ve done a little bit more research. Micah: Yea, that makes sense and it’s kinda funny when that happens too because you get into like a sub-optimal system sometimes and you’re so far into it that then you’re like “oh the pain of switching is more than the pain of finishing in this crappy system” you know. I know Heath, he knows what that’s like with what he was using before but, you know, I’ve done the same thing myself and one of the things I’ve also done is I’ve added too many features to my membership site. You know, I said “hey live webinars and hey community” all this stuff versus, and this is kinda a message to membership site owners out there or somebody who is trying to make a membership site, you know, you wanna keep in mind what you’re committing yourself into, right. Cause so many people think oh I’m gonna make a program like these other guys and they include one on one coaching and webinars, you know, all these things are included on this membership site so I need to that. It’s like, slow down a little bit, cause you’re gonna kill yourself and you’re gonna hate the fact that you committed to that if you haven’t thought it through. So the same is like choosing your platforms and knowing what you wanna do, kinda know what you don’t wanna do. If you don’t wanna present a live webinar once a month don’t feel compelled to promise that to your members. You know, you don’t have to put everything in there and that’s why I like both of these cases. On the screen where I’m now you can see on the left there’s a link to my webinars there and I believe, Heath this might have changed, but I believe that’s kinda the superficial link that just goes to the webinars that you guys are already doing, it’s not like you created them just for this, you’re already doing them, you just wanted to have them as part of this overall experience so people can see “oh I’ve got this structure training and I got access to these other things” right? Heath: That is correct, we understand that everybody learns differently, everyone has their own preference in learning so and there is some material in these live webinars that maybe isn’t covered as heavily in the recording so we’re trying to give a user as much value as possible without over complicating the system. My goal when I built the Small Business Success Academy here for our customer training was to keep it simple. We don’t wanna, you know, our customers are already trying to learn something new o let’s not over complicate the process, let’s make it as easy as possible. And that’s what Memberium and LearnDash has empowered us to do, it’s just that. I can tell from a positive feedback perspective, again, I’m still yet to get one negative response from a customer and the system and the flow and the functionality of the site. They love the ease of use, that’s like the number one, you know, pillar when I ask them what did you think about the academy. That’s what I keep getting and that’s all compliments to Memberium and to LearnDash making it easy so the live webinar thing was just another tab, we just threw in there to give them something to tap into. If you were to click on this, it just redirects right to our help center where you can actually register so nothing crazy, just another page with a link to our help center. Micah: Yea, it’s nice and simple and I like what you said there, they’re already trying to learn something new, they don’t need to learn a new system, right, they don’t need to learn a new environment, you just kinda give it to them and I’ll give credit what credits do, it’s really mostly LearnDash providing like the customer experience. Memberium does a lot in the back and connections so that LearnDash can work with Infusion but like I said what credits do is that like yea the user experience is really being created here mostly by LearnDash and Memberium can aid in that, can switch things on and off so it’s necessary for using Infusionsoft at least. That’s a really good point, they’re already trying to learn something more so just make it easy. What I wanna do real quick is I wanna mention that underneath this video is a box where you guys can put in your questions so anyone watching you can put questions in below this video and we are going to do a follow up call and answer those questions live so if you put your question in underneath this, you’ll get information about that follow up call. If you’re on our list you’ll probably get that information anyways but just wanted to touch on that real quick so if you have had questions come up or if you have questions now make sure you put them in under the video if you hadn’t noticed that questions box yet. And, let’s go ahead and just ask Heath and Justin what else do you guys have to share if anything, or any other kinda last thoughts as we’re coming to an end here and you have plenty of time so go ahead with whatever but yea, is there anything you guys are thinking of and wanna get out, Justin? Justin: Yea sure, I think there’s kinda a hidden agenda Heath had mentioned in all this conversation, I wanna pull out and with the question earlier, Micah, like what do you know now as you go into creating a new product or a membership site and that is listening to people that are actually taking it and people that are engaging with your site. And Heath said earlier that the new customer onboarding was just kind of a pilot and now he’s collecting a feedback and he’s gonna improve the course or the whole platform. Maybe add some of those features that people are asking for but if not, there’s no need to so I think you know, getting something out there that looks good and then putting your ear to the ground and listening and seeing how people are using it, what the pin points are, how you can adjust it to increase your conversion rates and then that’s how you create a learning experience and a membership site that is going to convert or have people complete the course and learn the content. Heath: Yea, I actually wanna piggyback off that cause I had a meeting with some of my colleagues yesterday and you know, we talked about how easy it is to get the focus on the outcomes that we seek internally. Every company has got their own internal matrix that they’re trying to hit. They’re trying to lower cancellation rates, you know, decrease turn, you know, we have all these other internal words we use for a specific matrix that we’re trying to improve everyday but what really matters is if you focus on what the customer wants and needs, the internal matrix will come with that. So, you know, this platform, as we design this, we’re using this to say hey, like, disregard what we’re trying to do internally, mister or misses customer, what do you need, how can we help you be successful in the first 30 to 60 days because we would hypothesize that if we can successfully do that for our new customers coming in the door, the other matrix will just come. And so that’s the approach I’ve been taking as I built this, it’s just focus on the customer, it’s all about them, it’s not about us. They’re the hero, we’re just here to serve them and help them become a hero. So that’s the biggest piece of advice I would give any company moving forward and that’s really what I learned here at Infusionsoft. It’s focusing on the customer, they’re the number one important thing and you can take that exact same mindset when building a membership site as well. Micah: Yea, absolutely, like just intention focused, right? So, we’ll put some links under the video but just in case someone’s watching this, you know, who’s not using Infusionsoft, like I mentioned earlier, it’s obviously a marketing automation software but we’ll put something below the video you know, to connect with Infusionsoft, if you wanna ask them questions or look into getting it. If you’re not using it yet, we’ll also put information below this for LearnDash so you can get started with that and, like I said, there’s a question box too, where you guys can ask us and we’ll get on and answer those live a week after this video is released. But, I just wanna thank you guys, so Heath and Justin, you guys are people that I really really respect in the learning space and, you know, obviously, Heath you’re doing cool things here, Justin your software is always getting better and I really appreciate that. So guys thanks for coming on, I really appreciate it. Heath: Thank you, Micah, all the pleasure is on this side. Everything that you and Justin have provided us here at Infusionsoft, we’re extremely thankful for and look forward to continue to learn and grow in both plugins as we move forward. Justin: Yea, it really was great seeing you two set up, and Micah thanks for getting us together, this was fun and very informational. Micah: So, again for those of you watching go ahead and put your question in the box below, anything you wanna ask and we’ll send you some information about a follow up call where we will answer those for you but thanks again, check out the links below the video and we’ll talk again soon.